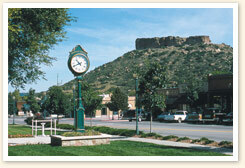 In 1980, the population of the Town of Castle Rock, Colorado was just 3,900. By 2013 the town had grown to over 53,466. Despite this fast expansion, the town retains its small-town character, beautiful views and Old West charm. The Town of Castle Rock, Colorado ranked 17th in the 2012 “America’s best small cities” by CNNMoney, while Family Circle ranked it among the 10 best cities in the nation for families. Before white settlers arrived in 1874, Native Americans of the Arapahoe and Cheyenne tribes appreciated the Castle Rock, Colorado area for a location shielded from the winter storms of the mountains and the extreme heat of the eastern plains. Its grassy foothills also provided game like antelope, buffalo, deer and rabbit. Jeremiah Gould, one of the town’s earliest settlers, was attracted to the area by rumors of gold. Gold was never found but another resource, rhyolite stone, a volcanic rock seen in many local buildings, gave the Town of Castle Rock, Colorado an economic foothold. The geographic feature known as Castle Rock overlooks the town by the same name. The rock formation can be seen from I-25 and many places in the Town of Castle Rock including The Meadows. To this day, “The Rock,” remains an iconic figure that welcomes travelers while offering favorite destination along the town’s network of hiking trails. Click on the links below to learn more about Castle Rock history. Who was Philip S. Miller?